Now that you have a basic understanding of buckets and documents, you can try querying them using N1QL (pronounced "nickel"), the Couchbase Server query language. N1QL embraces the JSON document model and uses SQL-like syntax. In N1QL, you operate on JSON documents, and the result of your operation is another JSON document. You can run N1QL queries from the command line, using the cbq tool; or from the Query Workbench in the Couchbase Server Web Console. Note that for all identifiers (bucket names) that contain a hyphen character, you need to enclose the name with backtick (`) characters. The country is thus specified as United Kingdom. The results thus contain five callsign values. A callsign is associated with an airline; and airline is one of the document types that the travel-sample bucket contains. Others are airport and hotel. Bucket Insights: Provides information on the buckets that are currently maintained by your system. Right now, it shows that just one exists; the bucket travel-sample. Query Results: Shows query results and provides a number of options for their display. To start with, you will use the default option, which is selectable by the JSON button, and duly displays results in JSON-format. To execute your query, click Execute. As you can see, a single document was found to match your specified criterion — the document whose name value is 40-Mile Air (which is, in fact, the document you took an initial look at during the previous step in this Getting Started sequence). The final step in the Getting Started sequence, Choose Your Next Steps, offers suggestions for learning more about Couchbase and using it for production use-cases. N1QL from the SDK: Explains how to execute N1QL queries programmatically using the official Couchbase SDKs. 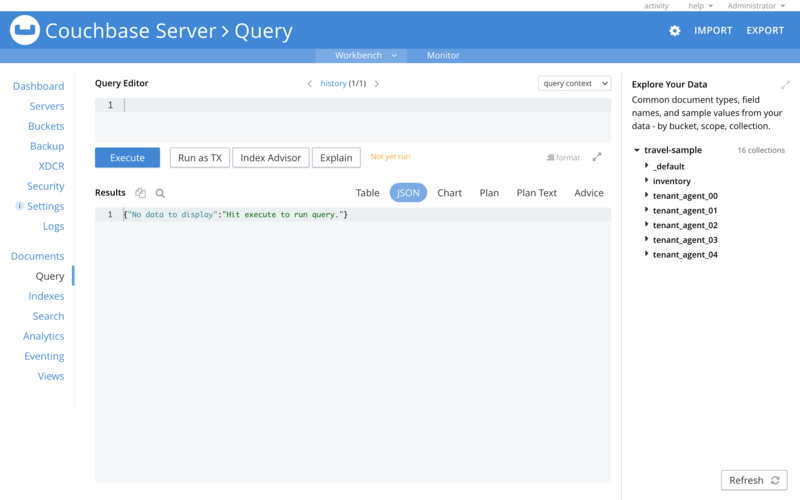 N1QL Query Language Tutorial: Provides interactive web modules where you can learn about N1QL without having Couchbase Server installed in your own environment. The modules are self-contained and let you modify and run sample queries. The tutorial covers SELECT statements in detail, including examples of JOIN, NEST, GROUP BY, and other typical clauses. N1QL Cheat Sheet: Provides a concise summary of the basic syntax elements of N1QL. Print it out and keep it on your desk where it’ll be handy for quick reference. N1QL Language Reference: Describes the N1QL language structure, including syntax and usage. Couchbase Webinars: Live and recorded presentations by Couchbase engineers and product managers that highlight features and use-cases of Couchbase Server, including N1QL. Couchbase Blog: Regularly-posted technical articles and announcements written by Couchbase employees, including SDK developers. Couchbase Forum: A community resource where you can ask questions, find answers, and discuss N1QL with other developers and the Couchbase team.